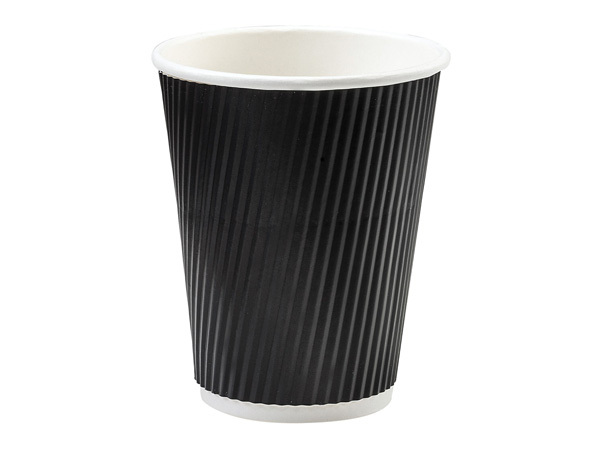 Black paper cups sold in bulk cartons. Holds 12 ozs. Insulated Paper Coffee Cups with leak resistant poly liner. Straight groove design provides insulation - no sleeves needed for most hot drinks. Cups are heat tested to provide insulation up to 175 degrees. Hotter drinks may require double cupping. Made in USA with water based inks, glue and coatings. . Custom Print Your Cups Here! Insulated Paper Coffee Cups with leak resistant poly liner. Made in USA with water based inks, glue and coatings. Straight groove design provides insulation - no sleeves needed for most hot drinks. Cups are heat tested to provide insulation up to 175 degrees. Hotter drinks may require double cupping. Available in solid colors and stock line designs. Complies with FDA regulations for food packaging. Paper cups are recyclable. Lids are available to help keep drinks hot. Black and white lids are made from polystyrene. Ivory lid is made from compostable PLA.